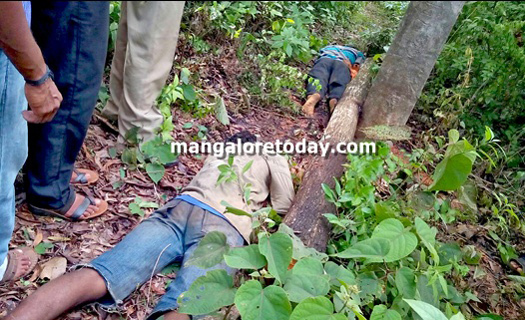 Puttur: June 23, 2015: Three people were electrocuted to death in two separate incidents in puttur on Monday when they came into contact with the high tension electric wire. In the first incidents, two youths Chandra (30) and Kaushik (21) were killed while were carrying wooden pole from a forest area at Anchinandka in Kumbra Section of Mescom. It is said that youths were electrocuted after 11-KV insulator got punctured due to heavy wind. In one more incident, a 60-year-old man was electrocuted in Bhaktakodi village in Puttur Rural Police limits. The deceased has been identified as Babu. Mr. Poojary said that Babu was reportedly trying to remove a tree branch from an electrical line. Police have registered cases of unnatural death even as MESCOM Managing Director Chikkananjappa said that the company would pay the kin of the deceased statutory compensation.